MiniG High Throughput Homogenizer for processing samples in plates, vials, and tubes. High throughput homogenizers have helped to break the bottleneck of sample processing in the age of genomics and proteomics. The GenoGrinder cleared the path for biochemical isolations from all types of tissues. However many labs don't need the capacity of the GenoGrinder, yet need more than a simple bead beater. Thus, the 1600 MiniG™ was developed to fill this gap. The 1600 MiniG™ has all the features of the 2010 GenoGrinder® but with only half of the capacity. However, with an adjustable clamp, it can still hold tall 15 and 50 ml centrifuge tubes, up to two deep well plates, racks of 2 ml disruption tubes, and up to two vial sets. Plates and vials sets are stacked. The 1600 MiniG™ has a digital timer and speed adjustment that can be set between 500 and 1500 strokes/minute. The homogenizer runs off of standard 115 V/ 60 Hz outlets (3 pronged plug). It is CE approved and has a safety shutoff if opened during running. 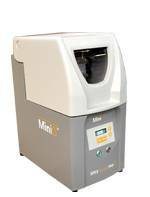 The 1600 MiniG™ is slightly smaller than the GenoGrinder®, its dimensions are 11.25" wide x 21.5" tall x 17" deep, and is less than half the weight at 40 lbs. It runs off of a 1/7 HP motor.